"I spent three years training with Nate. He created a progressive training plan that was conducive to my own strengths and especially respective of my considerable weaknesses. Despite a number of time and physical limitations he was able to help 'coach' me through completing the Boston Marathon and a Half Iron Distance triathlon in the same year. 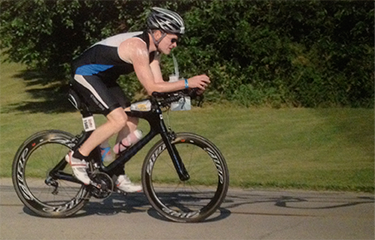 I used his training plan to persevere over the following year and set a PR in another Half Iron Distance triathlon. Most of all, after those races I wasn't wrecked and really felt prepared. I learned a lot about how to approach difficult times in training and his considerable experience was very valuable to me. I also felt that Nate's advice and recommendations throughout the off-season were spot on. His advice is contemporary, insightful and personalized. I would recommend his coaching to athletes of all levels and expertise."